This came, unexpectedly, in today's mail. I did not find it comforting. You took her tiny, delicate, lifeless paws and impressed them into the plaster. I would want it at all? I found it unsettling and sad. She was my friend, and my family, and to some degree I thought of her as my child. perhaps that should been have been a clue as to the appropriateness of this. I know your intentions were good, and I forgive you. But I am the one who has to live with this now. Grief is such a personal, subjective thing. This... token... has ripped open the pain again. It will stay buried in my other closet until I can decide what to do with it. Perhaps in a year I will be glad to have it. This was not a good thing you did to me. Ingrid, petcretary to Pipo, Dalton & Benji. This was deeply, deeply appreciated. This brings me comfort, to see her lovely little face. This was a celebration of Leia. Oh, I'm so sorry this brought more pain to you. I am glad, however, that this beautiful graphic brought you joy. 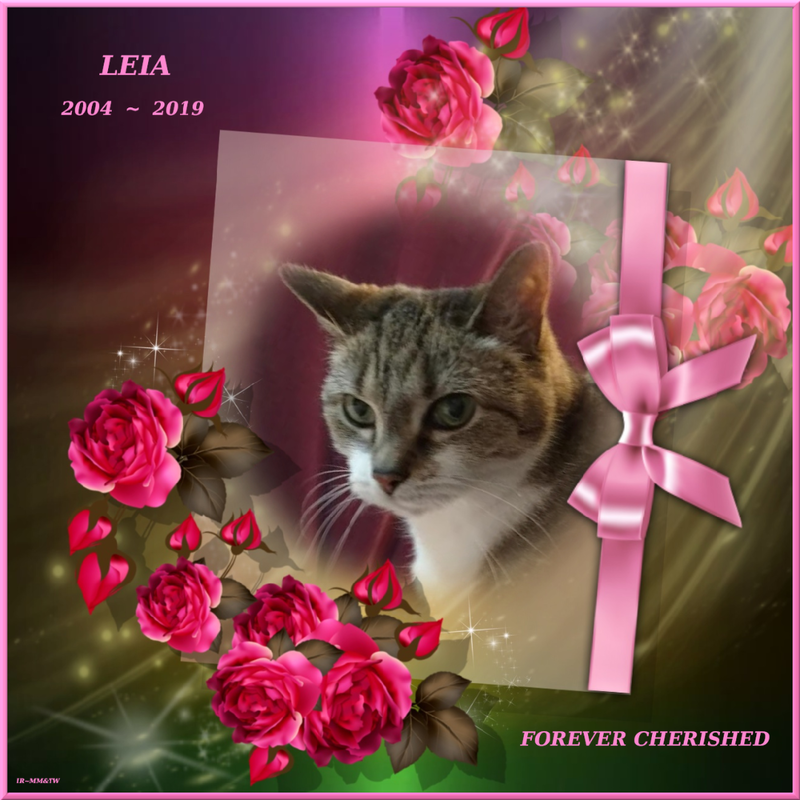 It is so lovely of your lovely Leia. Hugs and purrs to you and Toby from us. We are so sorry that the vet's office did not give that more thought. We can see that could be quite a shock, and a painful reminder at a time of grief when what you actually need is comfort. Sending you and Toby much love, light and purrs. I completely understand how you feel. It must have been such a shock to open and find it. I know they thought they were sending you something to remember Leia by, but they really should ask first. Memories are in the heart and mind, not a cold piece of plaster, no matter how well intended. These kinds of "surprises" are not happy. I'm sorry you didn't know this was coming. ITA that the office should have asked you first. Sending love and purrs. Whoa, I'd be angry and sad too! The morbid side of this freaks me out. Take care, and know that not everyone views life as you do. Angel Leia knows that you love her and continue to love her, even if her body isn't on Earth with you anymore. My word...you did not ask for this...I'm very surprised they did it without approval. I'm so sorry you had to re-live Leia's passing a second time. Madi's vet sent us a silver Christmas ornament engraved, "Forever Madi". I'm sorry this has brought more heartbreak to you. 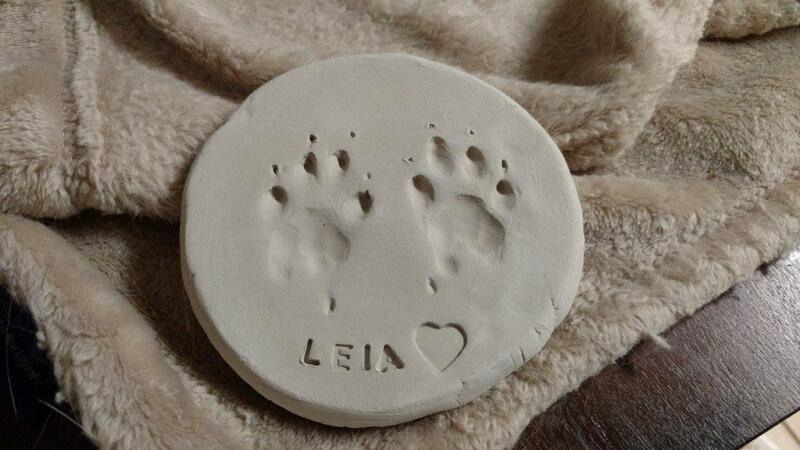 Those paw prints are so perfect and don't seem to be done on the fly ... is it possible that they just have a box of these with prints sitting around and they just added her name? Well, anyway, that's what I'm going to tell myself. That's what I wondered. I could have accepted that. But I called, they were her prints. I’m so sorry they did that without asking you and you have to suffer more pain. It is good you wrote to them, because they need to know it was not helpful to you, and they should probably ask if that is a remembrance someone would like to have before they do it. I am very sorry it caused you additional grief. The graphic is lovely. Our purrs to you for the unwanted remembrance. They should have asked. Sometimes people try to do things to help that seem stupid later. An example: When I brought LC to the Vet because she was comotose, they tried to help her but she died and they called me. I arrived. They made me wait 30 minutes to pick her body up because I hadn't brought the cat-carrier and they didn't have anything to put her in so they went out and bought some trash bags. I didn't need a carrier or a bag to put her in. All I needed was for them to hand her over to me. I can carry a dead cat. They were trying to help me not see her. Instead, all they did was make me angry that I couldn't just take my dead cat home. I will remember that frustrating 30 minutes all the rest of my life, knowing all I wanted was to have them give me my cat, and also knowing they seemed to be trying to protect me from seeing her dead. They messed up in both our cases. But they meant well. That doesn't mean we don't forget. I remember er seeing Admiral's prints. They were given to me as an after thought when I went for something else. And I met Katie at the same time. I have always looked at it as Admiral introducing me to K=atie and I always will try to see it that way. But like you with your little one, Admiral was my baby, my family member and much much loved Seeing her paw prints hurt horribly. I could not throw them away. They were/are hers. But I cannot bear to see them even now. They are in my oak library card case along with other things I cannot bear to see. I can bear her ashes here. It's a comfort. She rests on my dresser. The total complete truth is, Katie sits up there with them, coincidentally, many many times.